June 12 marks 50 years since Loving v. Virginia determined that the Racial Integrity Act of 1924, which banned marriage between people who were deemed “white” and people who were deemed “colored,” was unconstitutional. According to a Pew Research Center report released, 17 percent of newlyweds had a spouse of a different race or ethnicity – compared with only 3 percent in 1967. Even though there has been a large increase in interracial marriages, it is still in the minority. This can cause children of multicultural parents to struggle with their identity and their place in the community. This is exacerbated with the underwhelming amount of books, movies, and TV shows that feature multiracial characters. "This is the way that society is moving. We need to reflect that in the literature. We need to show children that this is a reality. Kids need to see themselves," said Selina Alko, author and co-illustrator of the children's book, The Case for Loving. "They also need to see people who don't necessarily look like them," added Sean Qualls, her husband and co-illustrator of the book. "Or [they need to see people] who look like them, but are actually different to show the entire range of who we are." Alko and Qualls, who are also an interracial married couple, were inspired to transform the story of Loving v. Virginia into a children's book, because they thought it was "shocking" and "upsetting" to think that they could not get married 50 years ago. They were able to get married with ease and with support from their whole family, but Qualls did admit that there still are microaggressions. "At times, there were, and sometimes there still are, a sort of feeling you get - it may not be verbalized. Obviously, it's not from everyone, but there may be an odd comment or two that's not directly sort of racist or judgmental. You think like, 'Woah, where is that coming from?'" said Qualls. Alko and Qualls are coming out with a new book soon called, Why Am I Me?, set in a subway where a white girl meets a black boy. They start wondering why they look like the way they do and why they don't look like the other. It explores identity and what it means to be comfortable with yourself. 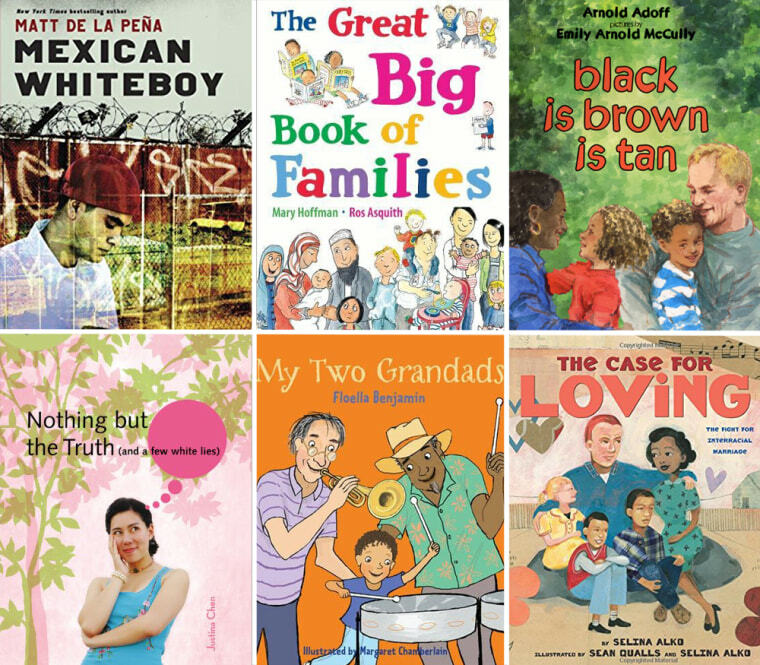 Take a look at our list below for children and YA books with multiracial children. "Black is Brown is Tan" was the first children's book published to feature a multiracial family when it was published in 1973. The book is a story poem and uses color imagery to show the many different skin colors that can exist. The story is told in a little girl's point-of-view as she visits her grandparents. The window of the house is a focal part of the story, as she explains how she interacts with her grandparents and their house through the window. The book is not overtly about multiculturalism, but the grandparents are of different races. A tender book about a Caucasian father and an Asian mother who narrate their baby's "firsts" as the child grows. The son of a Jewish father and Mexican mother struggles to decide what he will bring to school for International Day. The book comes with recipes and a Spanish and Yiddish glossary. Both of Alvina's grandmothers come to visit her while her parents are away. Grannie Vero is from the Caribbean Island of Trinidad and Grannie Rose is from the north of England. They want to eat different foods, play different games and do different things with Alvina and get angrier and angrier with each other. Alvina finds a way to make them both happy, so they can all get along. Aston loves learning how to play the steel drums from his Grandad Roy and learning how to play the trumpet from his Grandad Harry. When his school needs a band to play at the fair, both Grandads want to perform. Aston decides to combine their bands and plays both instruments during the performance, combining two distinct cultures. The book explains the story of Loving v. Virginia so children can learn about this monumental case from 50 years ago. With its use of illustrations and wording that's easy for children of a range of ages to understand, it's a good primer. Going through the pages of this book is fun for any family as they can point at different families and exclaim, "That's like us!" Mary Hoffman and Ros Asquith include families from all racial, social, and economic backgrounds to show that there is not one way to have the perfect family. Cooper becomes increasingly frustrated with his half Korean, half white heritage. He takes his frustrations out on Mr. Lee, a store owner who speaks to Cooper in Korean even though Cooper can not keep up. This mistake forces Cooper to realize that identity is never a simple answer and needs to be explored. Sean brings his dad to school, and his classmates immediately ask why they look so different. Sean doesn't know why either, so the teacher helps the students learn about heritage, families and diversity. An American sailor meets a Japanese woman during World War II. They teach each other the eating customs in each other's cultures. They later combine both cultures for their daughter. "Mexican WhiteBoy" focuses on Danny Lopez, who feels out of place at his predominantly white school, even though his skin is only slightly darker than theirs. Danny can't even speak Spanish and his mother has blonde hair and blue eyes, but his peers already have predetermined judgments. Curious to learn more about his father who is back in Mexico, Danny decides to spend a summer with his dad's family. After a horrible tragedy, Rachel, the daughter of a Danish mother and a black G.I., is the only survivor in her family. Her African American grandmother becomes her guardian, and she is put into a predominantly black community. Her light skin and blue eyes are always the first thing noticed. The story explores the mystery behind the tragedy and the ideas of race and class through the lens of a biracial character. Patty Ho desperately wants to be white, but her overbearing mom wants to shape her into a good Taiwanese girl. Struggling with her half white, half Asian identity, Patty questions who her white father was, why her mother is so strict, and what her family history is, as she spends a summer in math camp. Yumi Ruiz-Hirsch has Japanese and Cuban roots and her father is Jewish. She feels like her life is just as jumbled as her heritage is. The book is a coming-of-age story, as Yumi learns more about her dying grandfather, Saul's, past and realizes that life just happens. She can either choose to engage with it, or sit behind.